Monolith Software provides a next generation, service assurance solution that unifies fault, performance, topology, and service management in a single scalable platform. Our customers consolidate disparate and legacy OSS and IT monitoring tools to reduce operations costs by >50%, while significantly improving business agility, new service delivery, and customer experience management. The last ten years have seen the growth of cloud and virtualization, and more recently this trend continues with software defined networking and network function virtualization. Those organizations that can assure the deployment, availability, and quality of their services delivered during this race to evolve infrastructures, will reap the greatest benefit from these technologies. Achieving assurance now requires openness, scalability, and flexibility. The newness of these technologies means aspects are likely to change but assurance can not wait and must adapt as these technologies mature. 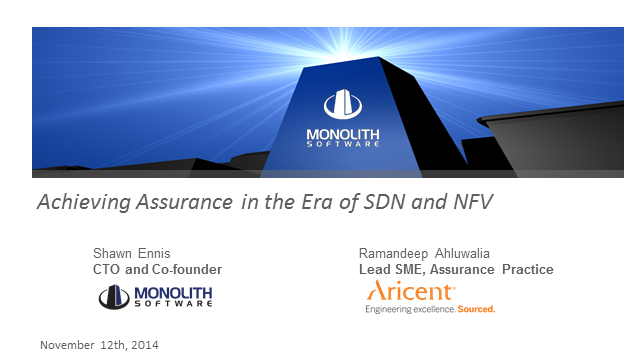 - Requirements for assurance in virtualized infrastructures. This webinar features service assurance research content from Analysys Mason, and a tools consolidation case study on how Broadvox drove their IT and OSS transformation with unified service assurance from Monolith Software.